There were hours spent on researching, testing and reading, and now our editor has her top picks for the best dog toy including the overall best dog toys, top pick for tugging, for chewing, most affordable choice and some great alternatives. Every dog needs dog toys at some point in their lives, but how do you find the best dog toy for your pooch? Some dogs only chew on toys when they are puppies and they require the oral fixation to help with teething. Other dogs chew toys and play fetch until they are well into their senior years. Depending on your dog’s age, size, and toy preference, there are thousands of different dog toys on the market for you to choose from. Me and my dogs have gone through and tested a mountain of dog toys to see how they work, and to find the best dog toy in each category and for specific reasons. Below you'll find my detailed dog toy reviews and how each of these options fair against each other, and what you must know before buying them. I chose Starmark’s Bob-A-Lot dog toy as my top overall pick. While there are better toys for dogs in specific categories (see those below), this one is a well-made dog toy that hits most of the marks. It's a treat dispensing dog toy that will provide your pet with hours of entertainment. I liked that it can be modified to be more or less challenging depending on the skill of the dog. The Bob-A-Lot is a performance driven toy that will get your pet up and moving, providing him with a better quality of life. * Please click on the dog toy brand for more product details and prices. Alternatively, scroll down to read reviews of each product. I set out to find the best dog toy available for all types and ages of dogs. I’ve spent many days testing toys with my dogs, and then plenty more hours researching best dog toys online and reading reviews from pet parents to finally come up with these top picks, and I hope you find this useful. The main goal was not only to find the best dog toy overall, but also rank some of the best toys for dogs in different categories. Very few toys can be great for different reasons, thus I've included the best dog toy for tough chewers, best interactive dog toys and puzzle toys, and a lot more. I also wanted to find pet toys that would entertain dogs for long periods and, of course, find doggy toys that would help puppies who are teething. You will see all my assessments below, can read the dog toy reviews and watch the videos. Testing wasn't the only part of this best dog toy review, either. I made sure that I know what others are saying about the toy, and what are the claims by the company. So once I found, in my opinion, the best dog toy that I thought may be a good choice overall, I went to company's webpage to gather more information. I wanted to know where this dog toy was made and what types of material was it made with. I did the same with all the puppy toys. Reviews from other dog parents were the last piece of the puzzle. I needed to know if other dogs actually enjoyed or hated playing with these dog toys, just as mine did, and how long these toys for dogs lasted with other owners. I wanted to find the best dog toy that appealed to pet parents as much as canines. That meant they had to be worth their selling price. Here's what I found. In our family, we have a 5-year-old boxer and a 12-week-old chocolate lab. It’s difficult to find the best dog toy that they will both play with. To make it more difficult, our boxer, Chloe, doesn’t really enjoy doggy toys and our puppy, of course, loves almost any type of puppy toy. There has to be some kind of incentive to gain Chloe’s interest. There usually needs to be some type of motivation involved. In this case, a treat dispensing toy will usually get her up off the couch. The Starmark Bob-A-Lot has quickly become a favorite in our house, and not just for the dogs. I love it too. It’s easy to use and entertains both of our dogs for 30 minutes or more. The simple design consists of two chambers. The top chamber stores the dog treats, and as your dog knocks the toy around, the treats fall into the second chamber. This keeps the toy from dispensing lots of puppy treats at once. As your Fido continues to play with the toy and jostle it around, the treats will eventually fall out of the small opening on the bottom of the Bob-A-Lot. Because of the round design of the toy, it does exactly what its name says – bobs… a lot. Whether your dog nuzzles, licks, scratches, or pushes this toy, it will continuously bob back and forth until your pet gives up playing with it. THE BOB-A-LOT GETS BOTH OF OUR DOGS OFF THE COUCH, MAKING THEM MOVE AROUND THE HOUSE AND EXERCISING. The opening at the bottom can be adjusted to cater to the size of the treats that you have or you can use it to make the game more challenging. If you make the opening smaller each time your pet uses the Bob-A-Lot, it becomes harder to get the dog treats out each time. Only the best dog toy will hold a dog’s interest for long of periods of time, and this one certainly does just that. We usually put about 20 training treats in the Bob-A-Lot, and it takes our two dogs about 30 minutes to empty it. If we give our puppy a chew toy to help with her teething, it works well, but she usually just lies on the floor and chews on it. As I mentioned, it’s hard to get our older dog interested in anything. We live in Maine, so often times the weather is too cold for our pets to go outside and exercise for long periods, but this winter we won’t have trouble finding something for them to do. The Starmark Bob-A-Lot allows our pets to exercise inside without getting wild and tearing the house apart. It’s great for hot, muggy summer days, cold winter days, and rainy afternoons as well. It’s no surprise that the KONG Extreme makes the list of the best dog toys. These puppy toys are known for their durability. Trust me, I looked high and low for the best dog toy that would compare with the KONG’s toughness, but it can’t be beat. Although some consumers did mention that extremely aggressive chewers can eventually tear through the rubber material that these toys are made of, it rarely happens. Usually, if a dog does chew through a KONG Extreme, the owner is at fault. There are different sizes of KONGs and there are also KONG Classic toys, which aren’t made for aggressive chewers. Make sure to purchase the right KONG for your dog if you feel this would be a good choice for him. If your dog is an aggressive chewer, you want to be sure to purchase the black KONG Extreme and not the red KONG Classic. These KONG toys aren’t the best dog toys just because of their durability. Like the KONG Classic, these dog toys can be stuffed with peanut butter or treats to provide your dog with hours of fun while you’re away from home. They help reduce boredom and separation anxiety. Many pet owners mentioned that they would fill the KONG with peanut butter (or any soft treat) and freeze it overnight. Then it would take their pup even longer to get the treat out the next day. The unique shape also provides an unpredictable bounce if you want to use this toy for a game of fetch. Another thing that I like about the KONG Extreme, and all KONG toys, is that they are made with natural rubber in the United States. These are one of the most popular dog toys on the planet, and they are often recommended by veterinarians, dog trainers, and other canine professionals. Nina Ottosson is a well-known designer of puzzle toys for pets. She started creating puzzle toys for her own dogs, as she didn’t have enough time to actively engage them the way that they needed to be. Most dog owners are in the same situation – they work away from home and their pets are left to sit around and wait for them to return home. Dog Tornado puzzle dog toy (level 2) can also be used for cats, which we've tried. Depending on the type and size of Dog Tornado that you pick, the prices ranges on Amazon are anywhere from $20 to $80 right now. This puzzle toy for dogs is definitely more difficult, and took a lot more training to help both my dogs and cats understand, but they cats in particular had a harder time because aren’t as food motivated as the dogs. This level 2 puzzle dog toy has layers of rotating discs that are shaped like dog bones. Three of the layers have compartments where you can hide treats. Your dog will have to learn to manipulate the different layers in alternating directions with his paw or nose in order to get the dog treats. At first, you can simply start out by hiding treats in the compartments and aligning the levels. Once your dog figures out how to spin each level and can get to the treats fairly quickly, it’s time to increase the difficulty level. There are four white plastic blocks included with this puzzle toy to make things more challenging for your pet. By placing the blocks in a few of the compartments, you increase the degree of difficulty. You can start by adding one block and then help your dog learn that he needs to remove the block to spin the level. There is a hole in the top of each block, so you can tie a string around them to make them easier for toy and small breeds or cats to remove. Dog Twister puzzle dog toy (level 3) was next on the list. This is one of the cheaper puzzle toys for dogs but not as popular. It goes for just under $20 on Amazon at the moment. Initially, I was fooled by this. The information that came with these toys stated that this was a level 3 Nina Ottosson puzzle toy. To me, it looked much easier to manipulate that the Dog tornado. Boy, was I wrong! This one was definitely a challenge for both of our girls. They didn’t have much experience with puzzle dog toys before receiving these, but I did help them. I also gave them plenty of time to get used to the Tornado before I introduced the Dog Twister. It took our boxer a little more time to figure this one out, but you have to consider the age difference and motivation for food between our two girls. Chloe is 5 years old and not nearly as motivated by food as our 7-month-old Saddie. The way this toy works, is that your dog needs to look for treats by moving one block after another around the circle. There are depressions under each block where a dog treat can be hidden. That part only took our lab about 2 minutes to figure out. She quickly realized that she could shift the blocks one at a time by scratching them with her paw. Once your dog gets the hang of sliding the blocks around the circle to get his treats, you can increase the difficult a great deal with the bone shaped pegs included with this toy. There are 12 of them. The blocks can be locked into position by these pegs. The pegs are a challenge to remove. Our boxer is a brachycephalic breed, meaning that she has a short, “pushed-in” nose. She also doesn’t have many teeth, making it nearly impossible for her to remove the pegs. She’d sit back and wait for her sister to do the hard work and she’d eat the treats. The Bob-A-Lot from Starmark is my pick as the best dog toy and it's definitely a great toy for pets if you’re interested in a treat dispenser, but that might not be all that your dog needs. Many dogs enjoy the mental stimulation of a more challenging interactive dog toy. That’s what they’ll get with the Activity Chess Dog Toy from Trixie. Talk about a challenge! It will take your pup a long time to get used to this game, and if you alternate it with a couple of other interactive toys, I’m sure this chess game would never get boring for Fido. The cones and sliders on the Activity Chess Dog Toy must be manipulated in the correct way in order for your dog to reveal his treat. Although it sits on the floor, this second best dog toy is equipped with rubber feet so it doesn’t slide around while your canine is using it. I would certainly say this is one of the more challenging interactive dog toys on the market. Along with the doggy toy, you’ll also receive an instructional booklet in the package that will help you train your dog to use the toy and show you how to increase the challenge as he begins to understand how to manipulate the obstacles. You’ll simply start out by only hiding a couple of treats, and slowly you’ll continue adding more obstacles and more treats as your dog begins to learn how to play. Activity Chess Dog Toy is definitely one of the best dog toys for occupying your dog while you’re unable to play with him or when you’re not at home. It consists of four cones and a number of various small holes and draws that you can hide treats in. Your pet will need to remove the cones and slide the sliders to receive his reward. It also comes with a one year warranty, which is a nice added benefit. Outward Hound dog toys come in a variety of styles to meet the needs of virtually any dog. For this best dog toy review, I particularly focused on their tough dog toys for strong chewers. Invincibles Gecko Stuffingless Squeaky Dog Toy seemed to be the favorite in our house for a while. Our Labrador, Saddie, and our Beagle, Molly, both love all plush dog toys. Molly is also strongly attracted to toys that squeak. Typically, plush toys for dogs don’t last more than a couple of days in our house. The cheaper ones don’t make it for more than a few hours. But the Outward Hound dog toys are made with the company’s proprietary Chew Shield layer. They also have especially strong binding. While they are more durable than most plush dog toys, they’re still not designed for power chewers. I love that these tough dog toys are stuffing free. Our girls haven’t ripped it open yet, but it’s nice to know that when they do there won’t be a stuffing explosion all over the living room. Another great feature is that the squeakers still squeak after being punctured. There are two sizes and two color choices available with these toys. Both the 2-squeaker and 4-squeaker variety sell for around $7.99 on Amazon. Fire Biterz Squeaking Plush Dog Toy was liked by my dogs but not as much as the Invincibles Gecko. I think it’s because the material is not as soft. This tough dog toy is made of the same material that they use to make fire hoses. To say that it's durable is an understatement. I will note that there are small arms attached to the sides of this toy, and my dogs ripped them off after about a week of playing with it. The stitching is strong, and it didn’t tear a hole in the body of the toy, so it’s really no worse for the wear. These Outward Hound dog toys are also equipped with squeakers that continue to squeak after being punctured. They are available in two sizes. The small is about 17″ long and has two squeakers. The larger one, which is the one that I have, is 25″ long and has three squeakers. These are a bit more expensive than the Invincibles toys, but they’re also a lot more durable. They cost between $8-$11 on Amazon. Bionic Bone and Bionic Stuffer dog toys are for power chewers. Our Saddie has powerful jaws, and these toys work well for her. Molly has a much smaller mouth and she’s not a power chewer. She’ll play fetch with these dog toys and sometimes takes an interest in them if Saddie already has one first, but she’s not a huge fan of them. I don’t think this is an issue with the toys though; it’s just a difference in our dogs’ preference of toys. These aren’t traditional rubber dog toys. They are made with a thermoplastic elastomer (TPE) material, which is a mix of rubber and plastic. They are BPA, lead and phthalate free. They can be stuffed with treats to provide a long-lasting chewing experience for dogs that just love to gnaw on things. There are no sharp edges, and they don’t splinter. The Bionic Bone is available in four sizes. We have the large size for Saddie. It weighted on both ends to create a spiral motion when thrown. It also bounces and floats in water. As I demonstrate in my video review below, Saddie loves to play fetch with these toys from Outward Hound. It has an unpredictable bounce that makes it an exciting challenge for her. Depending on the size you choose, these Outward Hound dog toys range in price from $10 to $25 on Amazon at the time of this review. Dogs are natural hunters and the squeaking of a dog toy fosters a dog’s natural instinct to hunt. The squeaking noise mimics the sounds made by pray as a dog attacks them. It may sound animalistic, but isn’t that what your pet is? Just because we’ve domesticated dogs doesn’t mean all of their natural instincts are gone. If your pet enjoys squeaker toys, the Skinneeez Fox from Ethical Plush is the best dog toy with a squeaker on the market, in my personal opinion. One of my pet peeves about dog squeaker toys is that they are usually stuffed, and stuffing makes a huge mess. I’m sure I’m not alone with those feelings. The great thing about the Skinneeez Fox is that it is a plush toy, but it is stuffing-free! Your dog can enjoy the feel of the plush toy and the fun of a squeaker, but there is nothing for him to pull out and strew around the house. Dogs love to shake toys around and flip them through the air. This toy is perfect for that. It’s light-weight and 24-inches long, making it ideal for flip-flopping fun. Many consumers also commented on how durable this toy is. The Skinneeez Fox is the ideal choice for dogs that love to chew on plush toys. There are squeakers in the fox’s head and tail, and many pet owners who purchased this toy said it was great for playing tug. I like the idea of no stuffing, because it makes it much easier to wash these toys. I’ve washed plush toys before, but they’ve exploded in the washer. One small tear in the seam and they come all apart. This toy has no stuffing, and it is machine washable. Just throw it in the wash when it starts to get dirty or stinky, and you’re all set. Tug-of-war is a favorite pastime for many dogs, but not all dog toys are built for the stress that tugging will put on them. The Mammoth Flossy Chews 3-Knot Rope is a tug toy for dogs that is virtually indestructible. It will take hours and hours of abuse from the strongest tuggers and can also hold up to aggressive chewers. The medium size rope is only about an inch thick, so this toy is suitable for almost any size dog. That’s great if you have a medium or large breed puppy, because you can purchase this toy for him to chew on while he’s teething, and you’ll still be able to use it as a tug toy years later. You could also purchase the small size if you have a small breed or the large size if you have an extra-large dog like a Newfoundland. An added bonus of this dog toy is that the premium cotton-blend rope fibers will floss your dog’s teeth as he chews and plays with it. When playing tug with your dog has he ever accidentally gotten your fingers when he’s readjusting his grip? That won’t happen with this pull toy. It’s 25 inches long, so your dog will have plenty of room on one side and you will be able to keep your hand safely on the other side without having to worry that your fingers will get bit. The Mammoth Flossy Chews 3-Knot Rope is ideal for tugging, but you can also use it for other games as well. It’s lightweight, making it great for a fun game of fetch, and it can withstand aggressive chewing as well. The knots of the medium sized rope toy are about 3 inches in diameter, so they are perfect for gnawing on in between rounds of tug. Here's something completely different that I thought might be interesting to include. Out of all the tested best dog toy brands, the West Paw toys did not come close in quality or affordability as many other best toys for dogs mentioned here. However, I really liked their design and looks, so I wanted to include them in the review. As you can see in my video below, our dogs enjoy playing with West Paw Rowdies dog toys. But let me tell you what you need to know about these toys. First of all, how funny are these dog toys? They all have their own names. We’ve had a lot of compliments on them when people visit our home, and I think they’d make a really fun gift for any dog or dog owner you may need to shop for. This is the main reason I decided to include them here and create the “best looking dog toy” category, since they don't really fit anywhere else. Once you get past their adorable appearance, you’ll also see that they are decently made. These West Paw Rowdies dog toys are made with HardyTex reinforced fabric that has a strong mesh backing. Can you see the little nubs that are used to make the “hands” and “feet” of these toys? They are made from West Paw’s unique Zogoflex material (which is a soft plastic blend). It feels similar to rubber is extremely durable to gnawing jaws. My dogs love these little nubs, and they haven’t been able to chew them off yet. West Paw is a very reputable company, which is something that is extremely important to me as a pet owner and as a consumer. Their toys are made in the USA. They also offer a one-time replacement or refund guarantee. Toys range in prices: Custer currently selling for $19.95 on Amazon, Sanders is selling for $24.95 on Amazon, and Fergus is selling for $24.95 on Amazon, too. Obviously, these best looking dog toys are quite a bit more expensive than other traditional plush dog toys. If you have a dog that likes to play with toys and isn’t a destructive power chewer, you’ll get your money’s worth out of West Paw Rowdies dog toys. For strong chewers, or those needing mental stimulation, I would choose any of the above or below picks. As I briefly mentioned earlier, before you find and buy the best dog toy for your pooch, you have many things to consider. Your dog’s size, age, activity level, and personal preferences will all play a factor in finding the best dog toys for him. Does your dog like to chew, fetch, tug, or all of the above? Does he need to get more exercise? Is he motivated by toys or treats? How is his dental health? What size is he now and what size will he be when he is full grown? Your pet's individual needs is what will decide the best dog toy specifically for your case. For example, if your dog likes to chew more than average, you’ll have to purchase a more durable toy, like KONG or Outward Hound toys mentioned above, because they won’t easily be destroyed by his strong jaws. It would be much better if you spent a little more money on the most durable dog toy now than continued to invest in cheaper toys for dogs that your pet is constantly shredding. If you spend $3 on cheap plush dog toys and your pet shreds them in a matter of days, a $20 durable dog toy would pay for itself in less than 2 months. Think about what your dog enjoys, too. Finding the best dog toy takes some trial and error for new owners. Is yours one of those dogs that just enjoys carrying a toy around with him everywhere like a security blanket? Does he want to fetch? Maybe he’s one that loves to tug? You should make your best dog toy selection based on what your dog’s personal interests are. If your dog likes to play many different games you don’t necessarily have to buy a lot of different toys. Just make wise choices and select toys (like a rope toy) that can be thrown, tugged, and chewed. You already know that when you make wise choices in the products that you purchase for your dog, they will enrich his life in many ways. They may get your couch potato up and moving or give your pet with separation anxiety something to do to keep his mind occupied during the day while you’re gone. Don’t focus on the cost of the toy, especially if it will last. I know we’re all on a budget, but a wise purchase will save you money in the long run and add to your Fido’s quality of life. Trust me, it will be worth it! To be honest, I am not a dog toy expert. I do not manufacture them. And even though I spent days for this best dog toy review, testing many toys for dogs, I do not do this on a regular basis. However, I do have a few things going. 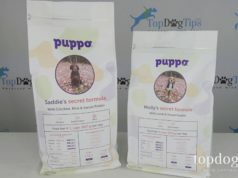 First, I've been testing and reviewing dog supplies for several years for Top Dog Tips, and had tried many different best dog toys, as well as other pet owners. Second, I have been a dog owner for my entire life and I’ve raised many different types of dogs. We’ve adopted puppies who chewed on everything in our home and older dogs that didn’t much care for any dog toys. We’ve bought treat dispensing toys for dogs, hard rubber chew dog toys, plush dog toys, and puzzle toys for dogs. I may not be a dog toy expert, but I certainly have a lot of experience. Not to mention, my career as a dog supplies reviewer and writer has made me an expert on completing copious amounts of research and finding reliable sources. The information in this article has been compiled not only from personal experiences but also from consumers, manufacturers, and product reviews done by trusted sources. Many pet parents do not brush their dog’s teeth regularly, and although chew toys are not a substitute for proper dental care, they can help keep the plaque and tartar buildup off your pet’s teeth in between brushings and cleanings. Healthy teeth and gums will lead to better overall health, so yes although it doesn’t seem possible, chew toys actually can improve your dog’s health. Furthermore, dog toys are some of the best ways to mentally stimulate your dog and keep his brain active. If you have the best dog toy for mental stimulation, it will have your pooch working on solving puzzles to get the treat, which in tern results in lower risks of depression, and a better overall well-being. Every pet owner should purchase dog toys. If you have a puppy, toys can be beneficial while he is teething. Instead of trying to chew on everything in your house, he will be able to chew the assortment of toys that you purchase for him. If your dog is an adult you can still use the best dog toy to entertain him and give him something to do while you’re out of the house. You can play games with him like tug and fetch, which will foster the bond that the two of you have. Nobody likes to be bored, and your dog is no exception. Some of those mentioned best dog toys on the market will stimulate your dog’s brain and get him up and moving. Whether your dog is an aggressive chewer, likes to play fetch, or enjoys using his mind to manipulate toys and find treats, there is a dog toy on the market that will provide exactly what he needs. Dog toys are quite possibly the most versatile pet product that you’ll ever buy for your Fido. 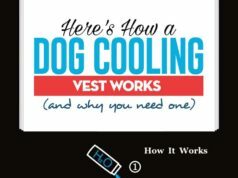 They can be used in so many situations and will benefit your dog in several different ways. If you make wise choices, you’ll be able to purchase the best dog toy for your pet that will last for years and be worth the cost. I won’t lie, finding the best dog toy out of the pile of tested, and then also ranking other best toys for dogs on this list wasn’t easy. Walk into any pet store or do a quick Google search for dog toys and you’ll realize pretty quickly that there are thousands of options to choose from. The first step was to get rid of all the low-quality poorly made toys that broke or ripped within minutes. I also weeded out the toys that weren’t safe. Still, there were hundreds left to choose from. The only way to figure out which products were the best dog toys was to break them into categories. I wanted to find the best dog toy for all different types of dogs. I needed to find the best toys for chewers, tuggers, and fetchers. In some cases, these things overlapped, but in many cases there were certain toys that stood out as the best in one certain category. The toys that made this list of the best dog toys had to be made with quality materials, and they had to be safe for dogs. I was searching for toys that would keep a dog’s interest for longer than five minutes, and toys that would benefit the dog in multiple ways. I looked for toys that were good for dental health, got dogs to exercise and toys that challenged the canine mind. The above mentioned best dog toy options, the first five, are my top picks. But all of these toys I've reviewed in this article stood out above the rest that I left out. Dogs love them and their humans were impressed too. Although these aren’t the cheapest dog toys on the market, they are well worth the price that you’ll pay. I knew when I started out to make this list that any toy that I selected would have to make pet parents as happy as it made their dogs. On top of trying toys with my dogs and putting them through days of tryouts, I've also went out to do some research that would assist me in picking out the best dog toy. My research was done primarily online through manufactures websites, consumer reviews, and articles and blogs from experts in the pet industry. Some of the research was hands on as I have used many of these toys myself. However, I still wanted to compare my personal opinion with that of experts and other pet parents. The first thing I needed to find out was what makes a really good dog toy. What were the experts looking for when evaluating dog toys? I knew the toys would need to fun, but what makes a dog go crazy for a toy? I know what makes a toy entertaining to a human, but what about to a dog? And what were the different aspects that I should be looking for when selecting toys for different ages of dogs? Obviously, senior dogs aren’t going to be entertained by the same things that puppies are. Then I began the research of my specific dog toys. I looked at the features of these toys for dogs, the materials that they were made with, the reputation of the company, and the price of the toys. Weeding out the poor quality toys or those that are unreasonably expensive cut the list of best dog toy products in half. Once I had a solid selection of toys I believed to be top-quality I went to the consumer reviews. I didn't trust my own opinion alone, and I wanted to know what dogs and their owners thought of these toys and what would they choose as the best dog toy. I needed to know if dogs actually enjoyed playing with these toys for dogs that I've already selected. I mean, a chess game for dogs? Who would think that a dog would actually enjoy that, but the consumer response was great! Even though it didn’t look like an average toy that a lot of dogs would like, it was! Consumer reviews really made the difference and helped me narrow my selections down to the top twenty. The Starmark Bob-A-Lot treat dispensing dog toy earned my top pick. It’s simple to use and has many benefits for dogs and their owners. This toy is also virtually indestructible. Our puppy has tried to chew the top of this countless times. First of all, because of the bobbing action she can’t get ahold of it very easily, and the hard plastic makes it impossible for her razor sharp puppy to bite into. The bottom part of the toy, the purple section, is weighted allowing it to bob back and forth as your dog paws, nuzzles, and licks it. The Bob-A-Lot also has an anti-slip covering that keeps it from sliding across hard wood floors. Speaking of hard wood floors, we’ve tried it on both carpeting and hardwood, and it works on both. It does bob more smoothly on hardwood, but if you have carpet, don’t count the Bob-A-Lot out. I also liked the fact that you can use a variety of treats with this toy. Some treat dispensing toys can only hold the custom treats made by the company that manufactures the toy. I think that is just a sneaky way for companies to force consumers to buy their products, and I do not like that at all. Starmark does make treats that will fit the Bob-A-Lot, but I found that any type of training treat works well. We also used some long jerky treats and cut them into small pieces. As you can see in the video, they worked just fine. The Starmark Bob-A-Lot toy engages many of your dog’s senses. As he pushes the toy around, he will hear the treats moving around inside. He can also smell the treats through the small treat dispensing hole. Watching the toy bob around entices his natural instinct to chase moving objects, and the fact that treats will periodically fall out of the toy will engage his sense of taste. This toy comes in two sizes so it can be used with any breed or size dog. It’s so easy to use that a child could fill it. You simply screw off the yellow cap and put the treats into the small hole in the top compartment. Then screw the cap on, slide the door of the treat dispensing hole open to your desired width, and set it on the floor. It’s also super easy to clean with just a little soap and hot water. The only flaw that we’ve found with this toy so far is that it is made in China. We usually like to purchase products that are made in the United States, and local items are even better, but it’s obviously not something that contributes to the toys overall effectiveness. Some consumers did note that because you cannot see inside the toy, they find it hard to clean. I run ours through the dishwasher and we’ve never had an issue. However, if you’re concerned about using soap, you could always dilute some vinegar with hot water, swish it around the inside, and make sure to rinse it well. I suppose if your dog was really intelligent he may get bored with this toy, but there are only a few consumer reports saying that their dog didn’t enjoy it. No matter what product you’re looking for, you’ll always find a couple of consumers who have negative things to say. The overwhelming majority of pet parents that purchased this toy say that the unpredictable bobbing action keeps their dog entertained for long periods of time. The Dog Activity Chess interactive dog toy was my second pick. 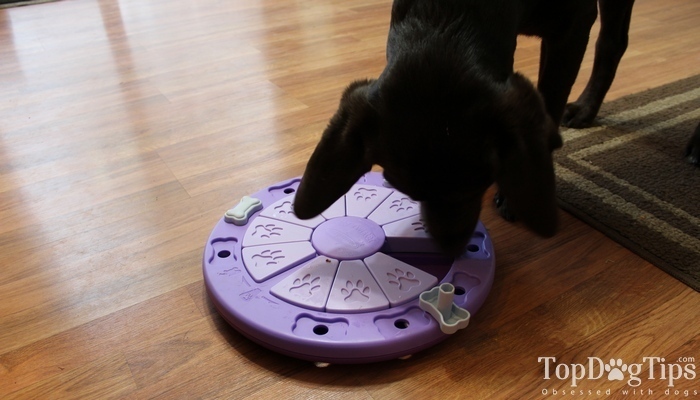 It’s a great toy that will stimulate your dog’s brain and get him moving. I love this game because it caters to all dogs with its different levels. If your dog is new to interactive toys and games, he can still learn to manipulate this toy from Trixie. At the same time, it can be adapted for more experienced dogs as well to give them a challenge that they will enjoy. You’ll get a booklet in the package if you purchase this toy that will explain how it works. The Activity Chess Dog Toy from Trixie has four levels. The first is the easiest and it builds in intensity from there. Level one only consists of your dog having to lift the cones straight up off the board to reveal a treat. In level two he’ll also have to move the sliders with his nose or paw. Level three is where it starts to get fairly difficult. This is when you will stack a second row of sliders on top of the first row. Each row moves in opposite directions. In level four you’ll use the cones as stoppers between the sliders, making it very challenging for your pet to get to his treat. He’ll have to remove the cones and then slide both sets of sliders to earn his prize. Dogs are playful and intelligent animals by nature, and this toy caters to those natural instincts. All the pieces of the Activity Chess game are dishwasher safe, so you don’t have to worry about drool and saliva building up in the holes. I also love that this comes with a one year warranty. I’m always skeptical about buying things with many parts, because if one part breaks the whole product won’t work. If you have any issues at all with this interactive dog toy in the first year, the warranty will cover it. These are some of the best dog toys on the market, but they are just the start of my list. If your dog likes to nuzzle around and find things, the Hide-A-Squirrel dog toy from Outward Hound will be perfect for him. Its name certainly gives it away. It is made of what resembles a small stuffed tree stump and there are three holes where stuffed squirrels are hiding. Don’t worry, if he rips one – you can buy replacement squirrels in three packs. Each squirrel is equipped with a squeaker, which will entice most dogs to go searching. The Hide-A-Squirrel is available in multiple sizes. The junior, large, and jumbo sizes include three squirrels, and the ginormous size includes six of the furry little buggers. Your dog can root around inside the toy to find the squirrels and then pull them out and chew on them. I normally don’t like squirrels in my house, but this game would certainly be fun for our puppy to enjoy. She loves digging around to find hidden things, and I would probably stuff a couple of treats in the holes once in a while to entice her too. Pet parents said that this toy keeps their dogs interest for quite a while and the squirrels and tree trunk are very durable. It’s not a great choice for aggressive chewers. However, the Hide-A-Squirrel toy is a great interactive toy that will give you the opportunity to play with your pet. He can keep pulling them out and you can continue to stuff them back in. Playing with your dog fosters the bond that the two of you have, and it is great for your dog’s emotional development. If you’ve got an aggressive chewer or an avid tugger on your hands, the Romp-N-Roll Ball from Jolly Pets would be a great interactive toy to use with him. This toy floats too, so you could use it for fetch and water retrieval. This ball is one of the most durable dog toys on the market. It is designed to be tugged, thrown, kicked, launched, and carried by your pet. This is really one of the best dog toys for an active dog. You can do almost anything with this ball; it is so versatile! The Romp-N-Roll Ball is made in the United States from a durable non-toxic Polyethylene plastic that is safe for you and your dog. It comes in three sizes: 4.5-inch, 6-inch, and 8-inch. Dog owners of all different sizes, ages, and breeds of dogs love the Romp-N-Roll Ball. Consumers have said that the material, although very durable, is not hard. Many compared it to the rubber material of a KONG toy. Your dog can sink his teeth into it, but even if it gets punctured, it still floats! It is really hard to find a bad review of this toy. If you’re interested in a tough toy that is eco-friendly, the Bumi Tug Toy from West Paw Design is what you want. It is made with West Paw’s patented Zogoflex technology. It is a buoyant material that is handcrafted in the United States, Certified Safe, and Guaranteed to Last. It’s also completely recyclable. In fact, if the company has any returned toys, defects in the factory or just the scrap material that is left over from cutting out the toys, they just melt it down and make more toys with it. Zogoflex is bendy, stretchy, and bouncy. This toy is fun to tug, throw, or chew. It’s soft, so it is easy on your pup’s teeth and gums, and it stretches without stretching out. These Bumi Tug Toys are really amazing. The company offers an entire line of Zogoflex toys, and they can all be thrown right in the dishwasher for easy cleaning. This dog toy may look a little strange, but its innovative ‘S’ shape is specifically designed for comfort and convenience while throwing, chewing, or tugging. They are also BPA and Phthalate-free and FDA compliant. Bumi Tug Toys are available in bright, easy-to-spot colors making them perfect for play in the yard or the dog park. Your dog will be able to see them easily, and if he gets distracted you’ll be able to find them quickly in the tall grass as well. Another product from Outward Hound, the Squeaker Mat Square, is available in four different characters including a hedgehog, a sheep, a pig, and a squirrel. If your dog likes squeakers he’ll be in heaven with this toy. There are four rows on these mats and each row contains four squeakers. That’s a total of 16 squeaker dog toys in one toy! The long, floppy bodies of the Outward Hound Squeaker Mat Square are fun for tugging, shaking, and dragging around. There is a small amount of stuffing in them, but not much. It’s mostly just a lot of durable seams, which hold each squeaker in its own square so they don’t get all bunched together. Last, but certainly not least, is the Jim Hodges' Dog Training Elk Antler Dog Chew. These dog chews are exactly what they sound like – naturally shed elk antlers. They are picked off the forest floor in the United States. They are actually hand-picked and hand-sorted for the best quality. I like the idea of these chews because they are not stinky like marrow bones or sticky and greasy like some rawhide chews. Another huge benefit to these dog chews is that they last much longer than most traditional chews. Elk Antlers are organic as well. Elk Antler Dog Chews are a great source of natural calcium, phosphorus, zinc, and magnesium. Their hard texture is also great for scraping plaque and tartar off your dog’s teeth. The only thing you should know about these chews are that it is very important that you select the right size for your dog. If you buy a size that is too small for your pet it may pose a choking hazard. With new technologies come new products. The pet industry is growing at an alarming rate, and there are sure to be new toys released regularly in the future. With new research being done every day, you can be sure that you will be seeing more toys catering to the natural instincts and individual needs of dogs. Technology is also changing the dog product market. There are toys that make noise, shake, and light up to get your pet’s attention. Surely we’ll soon see toys that will benefit pets in more ways than we ever thought possible. Canine health is a growing concern for pet parents, so you can also be sure that we’ll be seeing more toys being created that will benefit our dog’s oral health, healthy brain development, and overall health and well-being. Remember that price shouldn’t be your biggest deciding factor in which of the best dog toys to buy. You will end up saving money in the long run if you purchase a quality toy now and continue to use it throughout the life of your dog. Also keep in mind that your dog’s needs are as unique as he is, and you need to focus on those needs when selecting a toy for him. Keep your dog’s safety in mind while you’re shopping as well. It would be wise to do some research online before heading to the store. Make sure the product you select is made with quality materials. that it is durable enough to stand up to your pet’s jaws, and that it is the proper size for him. If you’ve got questions about which toy would be the most beneficial, speak with your veterinarian, a local dog trainer, or other canine professional in your area. You can even consult the well-trained staff at your local pet store. When in doubt, bring your dog to the pet store with you and let him pick out his own toys. Many pet stores allow leashed pets into their establishment, and who better to help you pick out a toy for your dog than your Fido himself? Photos of StarMark's Bob-A-Lot and the video review by Samantha Randall. All rights to photos and content are reserved. I love the skineez – they last forever!